Fall in love with C Lazy U Ranch this autumn for your family fall getaway in Colorado! 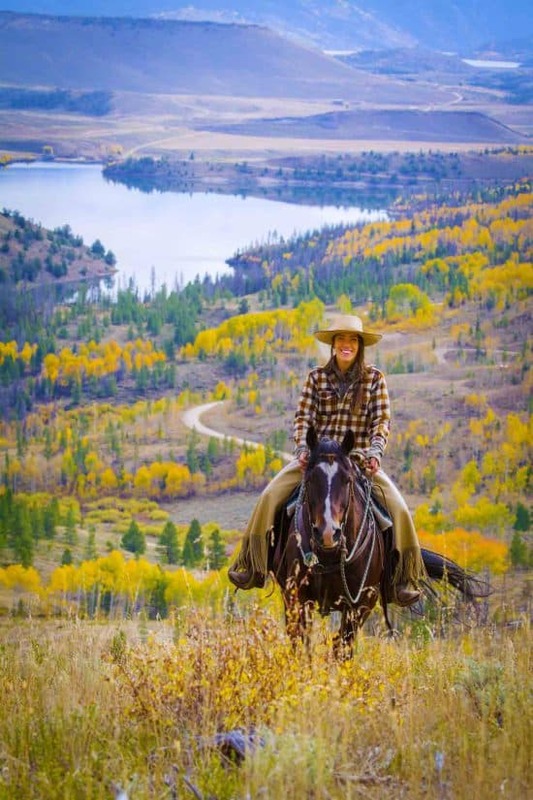 When the leaves will be changing and there’s a nip in the air with the nights are getting colder, means the fall season is a perfect time to come to our luxury dude ranch and have a blast! Don’t have time to accommodate an extended stay? No problem! Join us for this rare 2- or 3-night stay and enjoy gourmet food, luxury lodging, horseback riding and most ranch activities including our Orvis-endorsed fly fishing! Enjoy a Fall Getaway in the Heart of the Rocky Mountains in Colorado! Whether you are looking for adventure or relaxation, C Lazy U has an options perfect for you. All of our guests have access to a hot tub to keep them nice and toasty. Curl up next to the fire in one of our luxurious cabins and sip hot cocoa (or some whisky!) with your loved one after a long, fun day on the ranch. Bundle up and go horseback riding on one of our beautiful mountain trails and admire the ever-changing-color leaves before they fall. We are one of the premier horseback riding ranches in Colorado and are known for our beautiful horseback riding trails and horses. If being outdoors isn’t your thing, we offer a 12,000 square foot heated, indoor riding arena, providing year-round fun. A stone’s throw away from the beautiful Colorado River, we offer fly fishing, and have been recognized by Orvis as part of its collection of top-quality fly fishing lodges. We provide all the necessary equipment, which includes Orvis rods, reels, flys, waders and boots, that will withstand even the brisk autumn-chilled waters. Guests of all experience levels will have a blast catching rainbow, brook and wild trout on our private stream. A complimentary guide will teach you the ins and outs of fly fishing correctly, and we know you’ll be a pro in no time. This special won’t last, so book today!